Pope Francis wrapped up his visit to Georgia this evening with a plea for Christian unity. The Pope visited the Svietyskhoveli Patriarchal Cathedral in the spiritual center of Georgia, at Mskheta, which is just some 12 miles north of the capital city of Tbilisi. The Pope was greeted by His Holiness and Beatitude Ilia II, Catholicos Patriarch of All Georgia, who accompanied him to the shrine of St. Sidonia. 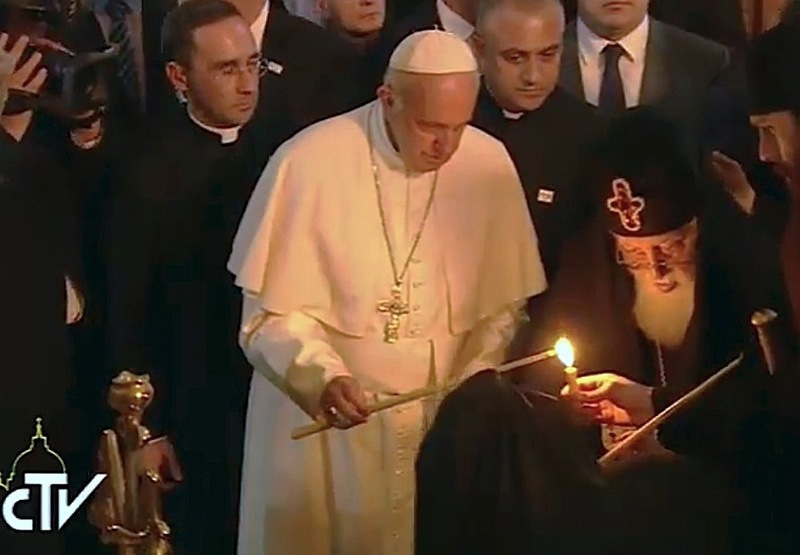 The Pope and the Patriarch placed two votive candles at the saint’s burial place. Ilia II welcomed the Pope and spoke of the suffering of the Georgian people as well as the history of the tunic and St. Sidonia. “Saint Sidonia belonged to a remarkable family of Georgian Jews: her brother Eliezer brought the Tunic to Georgia. Here, in the town of Mtskheta, their mother, devastated by the Saviour’s sufferings, on the day of His Crucifixion on Great Friday, died, and after her death, the Church of Georgia consecrated her also as a saint,” he said. The Pope referenced the tunic in his call for unity. The Pope’s reference to the commission comes as the Georgian Orthodox Church was in disagreement with the accord reached by the group in September regarding primacy and synodality in the first millennium.